In flight to San Francisco on the 27th of September 2014. Heading out to Oracle Open World for the second time. Much has changed since my previous visit. The previous time I came to this biggest of IT events in the world, I came as a spectator, representing an IT company, where my mission was to soak up as much knowledge as I possibly could, submerging myself in the flow of the event. This time ‘round, I come as a participant, representing another IT company that wants to add to the scene and deliver a smart alternative. And also personally there is a huge difference! Previously I went alone and was thrilled to find Frits Hoogland at the gate, which was already a familiar face to me back then! Now I am travelling to meet up with many more friends… listening to Metallica on the flight already reminds me that I will meet Gurcan Orhan over there! And in the pervious weeks many promises were made for quick meet ups and catch ups on the grounds of what we call “Oracle Open World”! Clock set to Pacific Summertime, good morning world!! Time has come a long way since my previous trip! Where I was bound to the onboard entertainment system a few years back, now I can work, prepare and write this text in flight. Hoping to meet all of you guys out here. And today, Oracle Open World came to a real kick-off, when we went to the Golden Gate Bridge Run, organized by @thatleffsmith, where we ran or walked with a great number of Oracle celebrities, ranging from @oraclebase through @helifromfinland and Frits Hoogland to @dbvisit! and there they all were, at the @oracletechnet lounge! 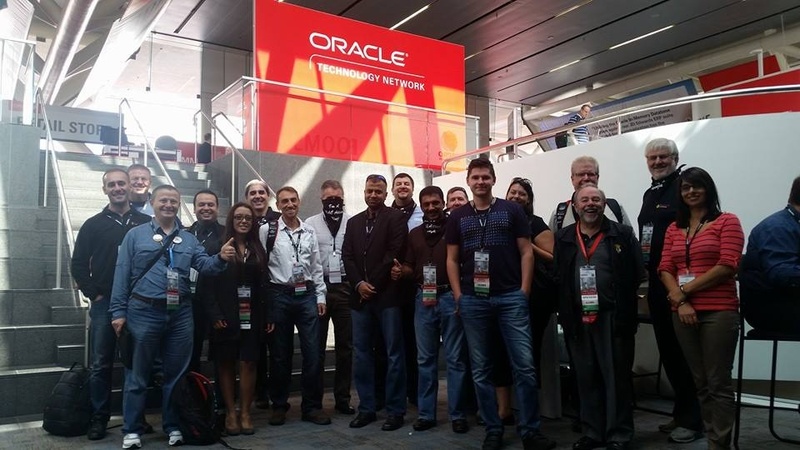 @OsamaOracle @alexzaballa @gurcan_orhan @brendantierney @yvelik and Many More! It is turning out to be a good day, with the building of the Dbvisit stand, sneaking into the sessions of the Dbvisit speakers and meeting many, many friends!